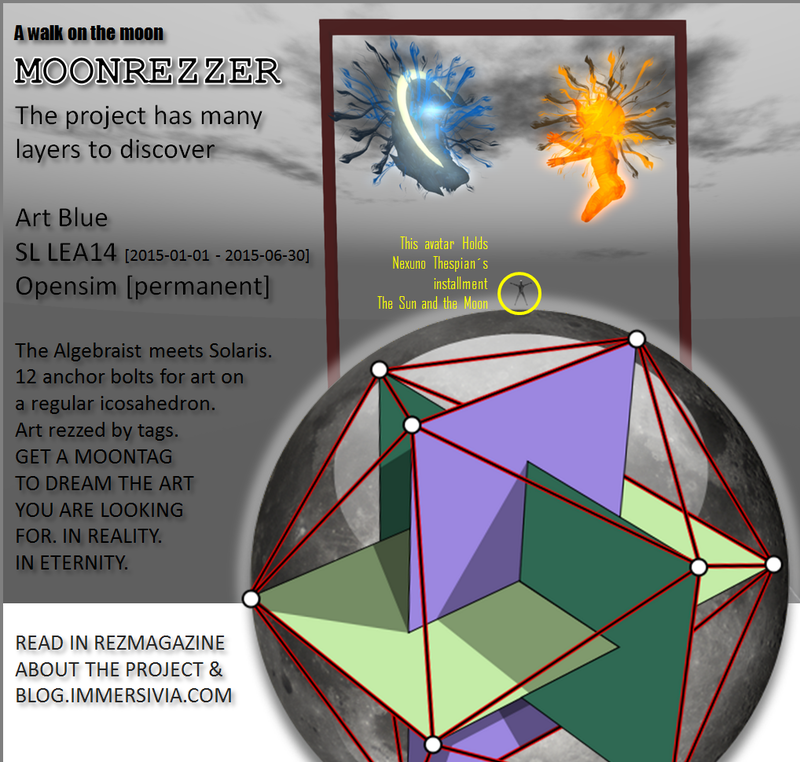 Your art work will be presented on the MOON by an Avatar holding your installment in a vitruvian pose. The attachment points are right hand and left hand. The shape of the avatar is the standard shape created by Phil Rosedale. You get a copy of the shape and of the pose so you can arrange it best. 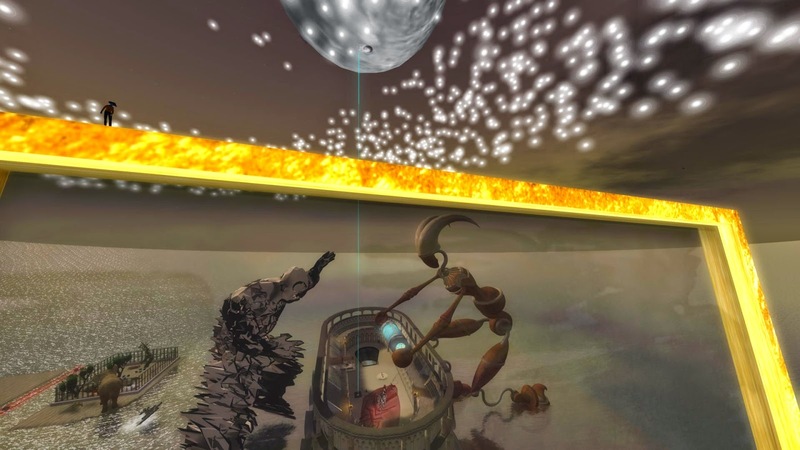 If you upload your art work in opensim it will be presented at IMMERSIVIA - Immersive Interactive Art - Santorini Bienniale 2016 and conserved for future generations in VULCANICUS. The moon up in the sky will be done by Giovanna Cerise. I asked her if she wants to take the job and she said: "YES!" More is not to say as Giovanne Cerise´s installment Chaos- Kosmos at LEA21  has been visited by more than 5.000 people. I, Art Blue, am a conceptual artist - but each concept needs the transformation to reality and I am so happy that Giovanna said "yes". Her fragile structures the fluid lucid dreams will do the moon good. When you enter the land there shall be something on the ground that is fitting. I have some pictures in mind. One is the Colloseum made by Exy Atreides. You see the idea as I wrote the application for the LEA grant. In the middle of the Colloseum will be an elevator up to the moon, a lifter. There is the greeter by Yooma Mayo [right] holding the capsule for the Annoying light and the mesh man by Giovanna [left]. This the part I claim as it is pure the concept. You may say parts are stolen from The Algebraist [Iain Banks], Solaris [S. Lem] and Anathem [Neal Stephenson]. I added the idea of art conservation - VULCANICUS. An Artificial Intelligence creating art on the moon surface. 12 spots are assigned, all having the same distance. Totally new ideas are rare. I believe it is rather impossible to do something that has no connections to ideas and projects done in the past, so I like to quote lines and copy ideas I find mind blowing. The Algebraist and Solaris [and the Blue Elephant, as described in my short story The Artefact] are some of them.